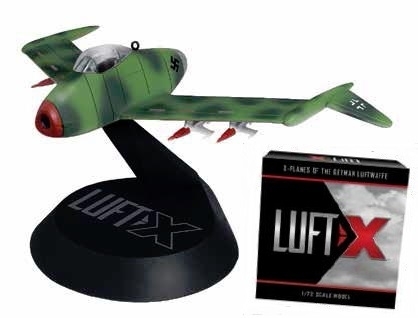 Answering the demand for something unique in the model aircraft industry, we are proud to introduce you to Luft-X, an entirely new series of scale military aircraft! These beautiful, 1/72 scale, resin models of experimental aircraft proposed by the Wehrmachts leading scientists during World War II provide collectors with something unlike anything else available today. Each limited edition, newly tooled model is certain to be a hit with World War II and aviation enthusiasts, so be sure to place your order today! One of the nice things about our new site is that it now allows us to highlight some of the more noteworthy items being released by each manufacturer. In the case of Luft-X, what follows is a list of some of the more intriguing products that have just arrived which we feel would be of interest to the savvy collector. The Bv P.210 fighter was one of Blohm & Voss' entries in the Volksjager Project competition in September 1944. Chief Designer Dr. Richard Vogt, assisted by Hans Amtmann, developed the BV P.210 from the BV P.208 tailless fighter project. The Focke-Wulf Triebflugel (Triebfluegel if the -umlaut is not used), or Triebflugeljger, literally meaning "thrust-wing fighter", was a German concept for an aircraft designed in 1944, during the final phase of World War II as a defense against the ever-increasing Allied bombing raids on central Germany. From 1933 to 1945, Blohm und Voss operated the Hamburger Flugzeugbau aircraft company. Although initially given the factory code Ha (for the factory's official name), the link with Blohm & Voss shipyards proved too strong and therefore the early aircraft designs were called "Blohm & Voss, type Ha..." followed by the design number. Also known as "Projekt 283" or "P.283", the Ta 283 was one of several programs being designed along the lines of ramjet engine propulsion by the end of the war. Ramjets offered considerable gains in overall speed when compared to even the fastest piston-powered fighters of the era but these systems could not take over propulsion of an aircraft until reaching approximately 150 miles per hour. In UFOlogy, conspiracy theory, science fiction, and comic book stories, claims or stories have circulated linking UFOs to Nazi Germany. The German UFO theories describe supposedly successful attempts to develop advanced aircraft or spacecraft prior to and during World War II, and further assert the post-war survival of these craft in secret underground bases in Antarctica, South America, or the United States, along with their creators. In August 1944 the Gotha Aircraft Company was given the job of series production of the Horten brothers' Ho IX all-wing fighter, which would be known as the Horten Ho 229 . After receiving the plans and design data, Gotha engineers found some areas for improvement. The Horten H.IX, RLM designation Ho 229 (often called Gotha Go 229 because of the identity of the chosen manufacturer of the aircraft) was a German prototype fighter/bomber designed by Reimar and Walter Horten and built by Gothaer Waggonfabrik late in World War II. It was the first pure flying wing powered by jet engines.